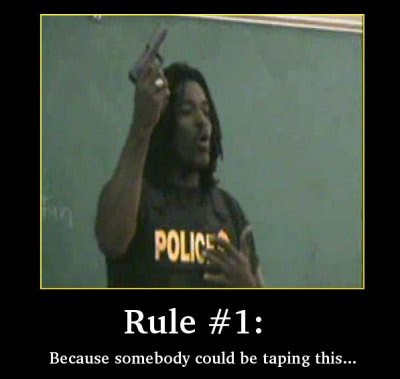 "I'm the only one in this room professional enough ..."
Thanks to our gun "experts" in law enforcement we have a new firearm safety rule. Civilians can't be trusted with firearms so we depend on them to show us the way. Sadly, even a Linguist who describes himself as a non-expert has better insights than a government-trained "professional." I've been on active duty since 2003 as a full time small arms instructor and have worked with tens of thousands of deploying Soldiers, along with a large number of Marines, Airmen and Seamen. A number of these folks have law enforcement experience. Excluding those with a competition shooting (or similar) background I can count the number of true shooting experts among them on my fingers. Not many of them were as notorious as everybody's favorite DEA Agent but few of them were true shottists either. Shooters involved in organized marksmanship events, such as competition, are the true experts in the marksmanship world. Tiger Woods would never have been recognized for his golf skill if he didn't bother to attend golf tournaments. There are probably zero golfers who have a similar level of skill but aren't also participating in tournaments. Marksmanship is no different!